Gopnik provides many examples to back up his claim, and ties it to the notion that, since most cultural gatekeepers are in their 40s, individual people also follow this same forty-year itch, and exhibit nostalgic longing for the period just before their own early-childhood memories kicked-in: “Though pop culture is most often performed by the young, the directors and programmers and gatekeepers—the suits who control and create its conditions, who make the calls and choose the players—are, and always have been, largely forty-somethings, and the four-decade interval brings us to a period just before the forty-something was born. Forty years past is the potently fascinating time just as we arrived, when our parents were youthful and in love, the Edenic period preceding the fallen state recorded in our actual memories.” For example, if you were born in 1973, you might have great nostalgic longing for the early-to-mid 1970s. Using Gopnik’s “Golden Forty-Year Rule” as an excuse to take a nostalgic joyride through company names of the past, we decided to take a look at some of the names of companies that were born in the past couple years and compare them to companies born forty years earlier (1970-71) and forty years before that (1930-31). Are there any observable patterns here? Are the current crop of newly minted companies influenced, perhaps subconsciously or culturally, by the Class of 1970-71, and were they in turn influenced by their precursors in 1930-31, in the heart of the Great Depression? And were those from 1930-31 influenced by the companies born in 1890-91? We’ll leave that to the reader to decide. Happy tripping down memory lane. Let it rain, let it snow, let salted streets splash and briny breezes blow! Corrosion’s passé with the aluminum grille and brightwork of your new Ford Falcon. Anodizing is the reason–an Alcoa process that makes aluminum sapphire-hard and sapphire bright. To preserve this royal sparkle year after shining year, merely wash down occasionally with plebeian soap and water. Elsewhere in the Falcon–in engine and transmission, to be precise–strong Alcoa Aluminum alloys trim off the pounds while adding speed and mileage. Look for aluminum in your next car. Aluminum Company of America, Pittsburgh 19, Pa.
Alcoa Aluminum…for lasting Gleam and Go! Obviously, whoever wrote this was a poet, trying to make ends meet as an adman by day. It’s also likely that this anonymous scribe (or, likely, team of scribes) never set foot in a South LA sweatshop that actually anodized aluminum (I have), or his metaphors might have tended more toward Dante than Tiffany. And in case you were wondering, doughtily is the adverb form of doughty, pronounced “dou-tee,” meaning brave, bold, intrepid, fearless, dauntless. 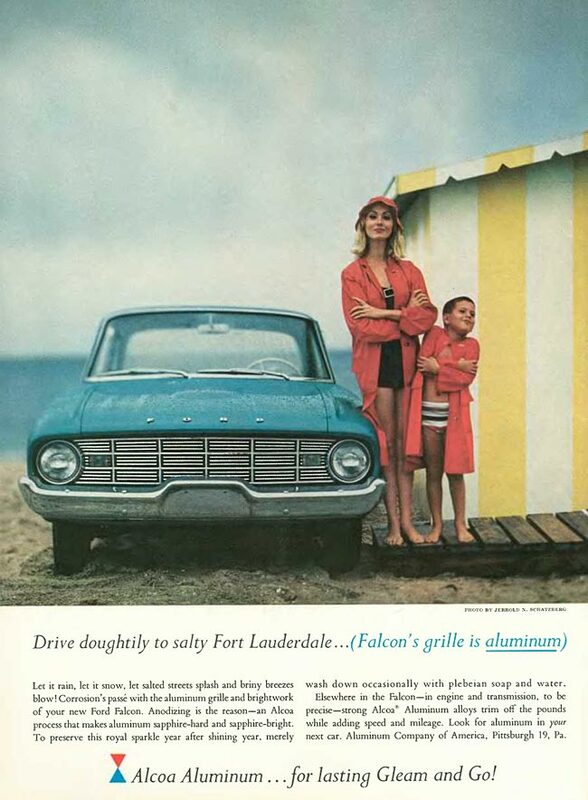 Not a common word today, and perhaps no more common in 1960, but what a great rhetorical flourish to combine it with “drive,” “salty,” and “Fort Lauderdale”–to create this poetic gem of a headline: Drive doughtily to salty Fort Lauderdale… Now that’s copywriting with lasting Gleam and Go!